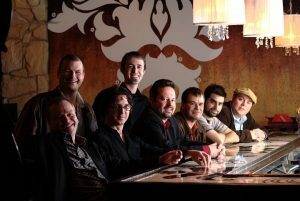 The Jazz Arts Group of Columbus (JAG) will enlist the infectious horns of the New Basics Brass Band to heat up the Lincoln Theatre ballroom on March 9, 2013 for the PBJ & Jazz season finale presented by Bob Evans Farms. Due to popular demand, this year’s season will continue to include two performance times per concert, beginning at 10:00 a.m. and 11:30 a.m. Originally launched in 1995, the sousaphone-driven New Basics Brass Band layers jazz, R&B, New Orleans funk, and groove sounds to produce party music for the masses. On March 15, the band will release their fourth studio recording titled Ditties for Kiddies, featuring eleven funky, jazzy, New Orleans-tinged takes on some fun kids’ classics along with a couple choice originals.